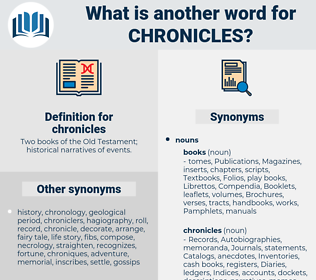 What is another word for chronicles? Two books of the Old Testament; historical narratives of events. 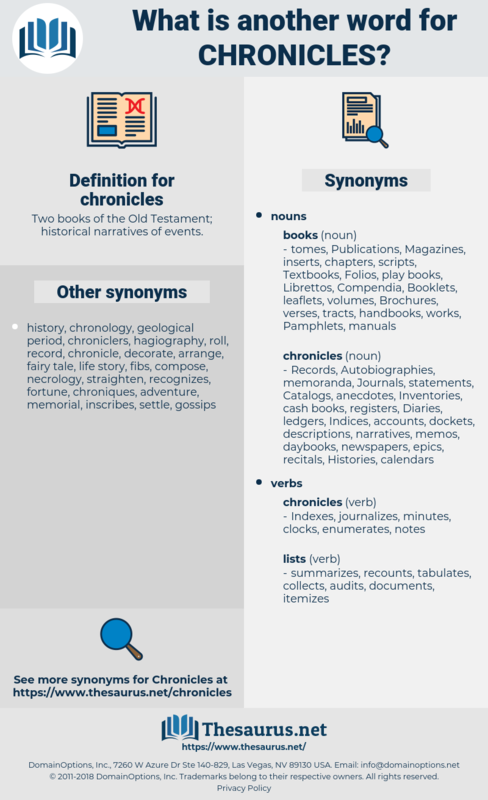 chroniques, columns, Diaries, Stories, words, accounts, features. characterizes, lesions, mentions, Records, outlines, illustrates, recounts, describes, explores, showcases, testifies, reflects, articulates, depicts, covers, incurs, demonstrates, encapsulates, suffers, registers, presents, illuminates, delineates, logs, follows, exemplifies, relates, portrays, tells, captures, shows, traces, Tracks, speaks, sticks, remembers, says. In the first place, until the eighteenth century was pretty far advanced, the conception and the knowledge of history as distinguished from the mere writing and reading of chronicles had been in a very rudimentary condition. The fourth, chronicles of the Order. ceremoniously, carmichael, crinkle, cringle, crown jewel, corn cockle, chronically, carnassial, crinkly, crank call, crown gall, caruncle, caruncula.